Miele Equine Laundry has been leading the development of laundry machines and general cleaning processes for over a century. Miele’s proven programs guarantee excellent treatment for every different type of textile. Along with their specialized machine systems for in-house laundry, which are adaptable to any size of business, the product line also has practical accessories. This includes water recycling modules, liquid detergent dispensers, plinths and coin operation systems. Contact us today to discuss the ideal cleaning services for you business! As all horse enthusiasts know, equine accessories require special cleaning due to the vast amount of hair, sweat, dust and other bacteria that constantly come into contact with these items. Making sure that all horse blankets, rugs, boots and saddle pads are clean can be vital to your horse’s hygiene. When these items are not clean it can reduce the lifespan of our horses and can cause regular skin irritations and fungal infections. We have a detergent that will be gentle on the horse’s skin, but still provide a great clean. To waterproof your blankets, use detergents along with a wash cycle that can use a waterproofing agent like Nickwax to maintain the blanket’s resistance to water. Commercial washing machines provide a large range or programs and can be programmed to fit your needs. There are cycles to disinfect fabrics, as well as delicate cycles specifically for washing smaller items like horse bandages. What are you washing? How often? What type of fabric? These are the questions you must ask to help you decide what type of commercial washing machine you need. 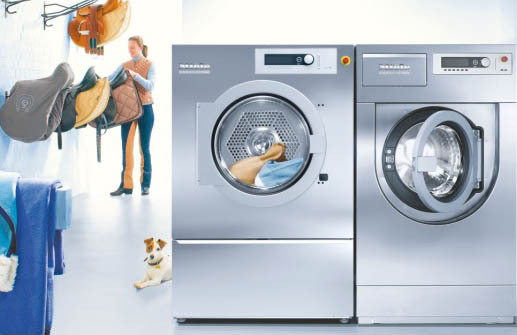 For example a standard commercial washing machine such as the Miele PW 6065 can either wash seven saddle pads, two summer blankets or one winter blanket. This is ideal if you do not have a lot of items to wash. 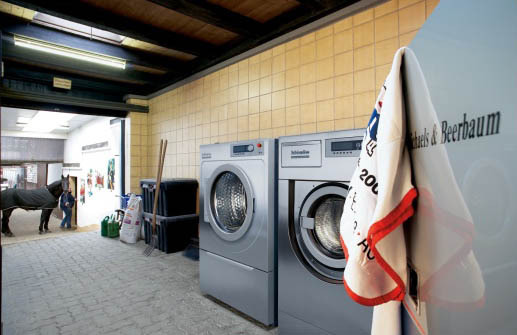 However, if you are a large facility with lots of laundry on a regular basis then the Miele PW 6321 would be a better option as it can wash up to 18 saddle pads, four summer blankets or three winter blankets.